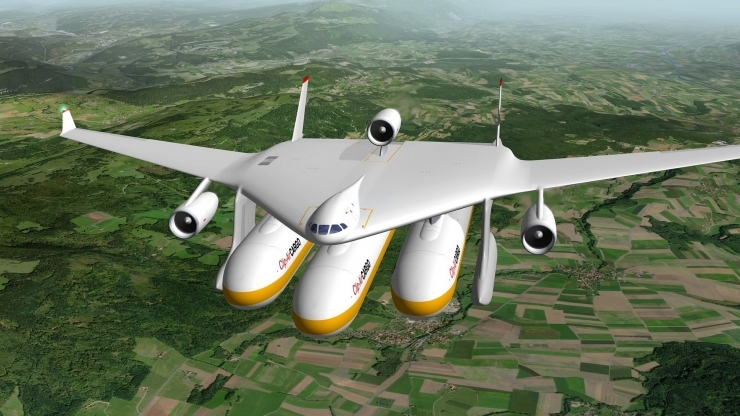 The Clip-Air project envisions an airplane consisting of a single flying wing onto which capsules carrying passengers or freight can be attached. More than a new type of flying device, its innovative concept could revolutionize the airports of the future. Go to the train station to take the plane. Board on a capsule to reach the airport by rail, and then - without leaving your seat - fly to another city. The Clip-Air project, being developed at EPFL since 2009, envisions a modular aircraft consisting of a flying wing onto which it is possible to attach one, two or three capsules as required. Its concept allows us to take a glimpse at the air transportation of tomorrow, which is meant to be more flexible, closer to our needs, more efficient and less energy-consuming. For the first time, a model of the Clip-Air plane will be presented at the Paris Air Show from 17 to 19 June 2013. Despite its being a very futuristic project, the scientists behind it work under rigorous constraints to maintain its technical feasibility. "We still have to break down several barriers but we do believe that it is worth to work in such a concept, at odds with current aircraft technology and which can have a huge impact on society," said Claudio Leonardi, in charge of the Clip-Air project. The Clip-Air project’s main contribution would be to provide rail transport’s flexibility to air transport. On the one hand, the Clip-Air plane includes a support structure made up by the wing, engines, cockpit, fuel and landing gear. On the other hand, there is the load to be carried: passengers and/or freight. Hence, the capsule would be equivalent to a real airplane’s fuselage, but without its usual attributes. The flying wing can accommodate up to three capsules with a capacity of 150 passengers each. Theoretical studies show Clip-Air’s potential in terms of transportation capacity thanks to a more efficient and flexible fleet management, a more efficient loading rate, increased flexibility of supply and the possibility of no more empty flights. Further advantages would come from savings in maintenance, storage and management. Clip-Air also aims to address current environmental concerns as wells as the objectives set by the ACARE (Advisory Council for Aeronautics Research in Europe) to reduce by 50% CO2 emissions by the year 2020. Clip-Air aircrafts’ conventional fuel consumption would be reduced since they can carry as many passengers as three A320 with half the engines. In other words, flying with three modules under the same wing in a 4000 km flight would be cheaper - in terms of fuel consumption - than three aircrafts of the same capacity flying independently and with equal speed and altitude. Then again, Clip-Air’s ambition also envisages other types of fuels, less polluting than the ones currently consumed. Several possibilities (liquid hydrogen, biofuels and conventional fuel) have been studied and have demonstrated the relevance of modular structures in terms of overall consumption. A Clip-Air aircraft could fit in an airport as it is conceived today. With its autonomous capsule, the size of a railroad car - about 30 meters long and 30 tons heavy - its design is compatible with rail tracks. Therefore, it could eventually revolutionize airport configuration and multimodal mobility. The boarding of either cargo or passengers in the capsule could be done not only at airports but also directly in rail stations or production sites. In technical terms, initial studies have shown that the project is feasible, even though there are still many challenges ahead. “The development of the concept requires performing more advanced aerodynamic simulations and testing a 6 meters long flying model powered by mini-reactors in order to continue to explore the concept’s flight performance and to demonstrate its overall feasibility”, added Claudio Leonardi. For now, a 1.20 meters long model of the Clip-Air plane will be presented at the Normandy Aerospace stand at the Paris Air Show, from 17 to 19 June 2013. At the moment the project involves researchers from three EPFL laboratories (TRANSP-OR, LIV and ICOM). It is coordinated by EPFL’s Transportation Center. Did Amelia Earhart end up a cast-away?